Contains: Two (13.3 g; 7.2 mL) cartridges and 1 Mixing Pad ONLY. 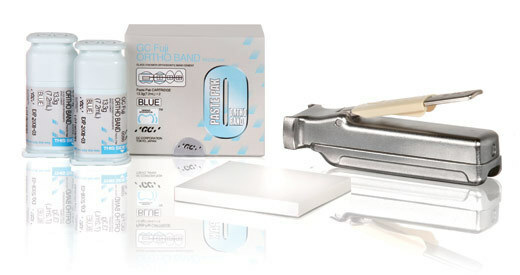 GC Fuji ORTHO BAND is a blue, resin modified glass ionomer for bonding orthodontic bands. It can also be used for the cementation of appliances retained with stainless steel crowns (ex: Herbst or expansion appliances). The new Paste Pak Dispenser saves time and reduces waste. It delivers consistent mixes every time, no matter the amount that the mix requires. Simply adjust the dispenser's metering slide and dispense the exact amount of GC Fuji ORTHO BAND Cement you need with the exact mixing ratio for optimized physical properties. GC Fuji ORTHO BAND Cement mixes within 15 seconds and has about 3å_ minutes working time with final set after 3 minutes (in the mouth). Its blue color distinguishes the cement for easy clean-up and removal.